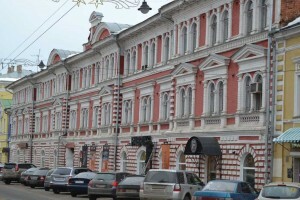 Culture | Nizhniy Novgorod, street Rozhdestvenskaya, the House 39. The house combines the classic and Baroque styles. This style can be called a merchant (Stroganov style). Nizhny Novgorod. Christmas ChurchBeautifully made balcony on the building of Nizhniy Novgorod, street Rozhdestvenskaya, house 45V.